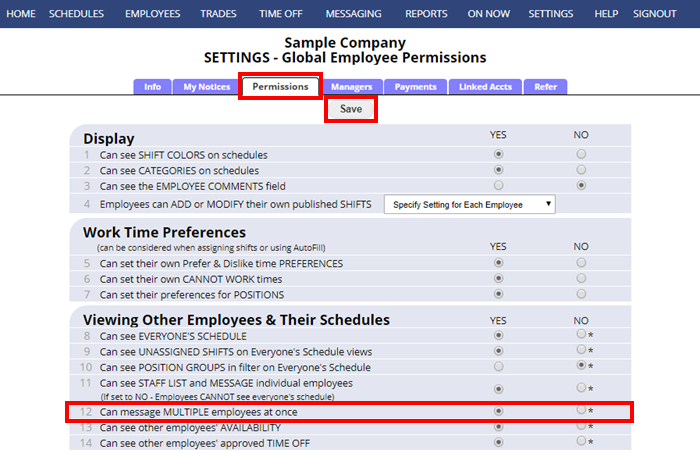 Managers (with permission to edit Company Settings) can choose to allow all employees to send messages to multiple recipients on their SETTINGS>Global Employee Permissions page. This option is defaulted to “No” but you can set that to “Yes” so that when employees sign in they can CTRL click multiple recipients in the “TO” field when they write a new message. Note that you can also allow employees to post bulletins to the Bulletin Board to communicate with everyone.